Vox Limited Edition AC15 To Carry WGS G12C Speakers. When pros think Vox, they think AC30 and AC15 ... and when a limited edition of one of these flagship amps are issued, it's always something special. 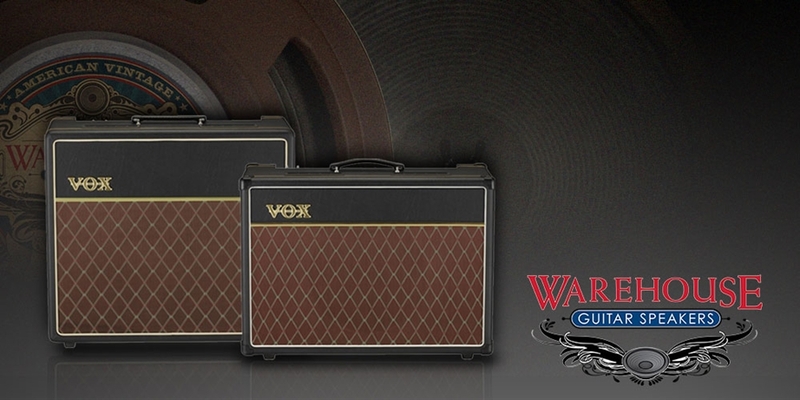 Traditionally, the most dramatic change to limited edition Vox amps has been largely cosmetic, previous editions sported British "Union-Jack" and other custom grill cloth designs as well as a plethora of tolex colors. Over the years a couple of speaker upgrades have been available in the limited models, although none have ever strayed far from the distinct mid-forward honk of the stock Celestion "Greenback" speaker. That changed dramatically in 2019 when the American made and American voiced WGS G12C was chosen to be installed in both the limited edition AC 15 as well as the top of the line limited hand-wired AC15 (models AC15C1-G12C and AC15HW1-GC12 respectively). To a Vox connoisseur, this is downright monumental. "One of the quickest and easiest ways to change the sound of any amplifier is to change the speaker. The various differences in materials and build process create unique personalities in both frequency and response. For example, some speakers will embellish the top-end treble for clarity, while others might subdue those higher frequencies for a warmer overall sound. Furthermore, different build materials change the way a speaker responds to your playing. Some speakers have a more aggressive response, making the amp more dynamic, while other speakers offer a naturally compressed, slower response, making the amp slightly less dynamic, but more forgiving and bluesy. With that in mind, VOX is proud to announce their latest limited edition line of AC15 amps, equipped with Warehouse Guitar Speakers’ G12C model! Completely handmade in Kentucky, USA, the G12C is part of Warehouse’s American Vintage series which lends a unique, American flavor to the iconic British chime of the AC15. These speakers provide a punchy low-end and distinctively clear top end that is still dynamic and sensitive. These limited-edition amps also feature a limited vintage-style tolex covering for a more refined appearance. Check these out today, and see what happens when you mix one of history’s most popular British amplifiers with one of the best names in boutique USA handmade speakers." Man them Vox folks are dead-on! "One of the quickest and easiest ways to change the sound of any amplifier is to change the speaker." Yep, that's what I've been preaching for decades now, and it's a solid fact, Jack! If ya want to dive deep into this topic check out THIS BLOG. 1) Yes! This is such a match made in heaven truly two great tastes that taste even greater together. As Cory from Vox UK elegantly stated it on the floor of the 2019 NAMM show "An American voice is going to give you a little more top-end, a little more bottom end, and it scoops out the middle a little, and what's great about an AC15 is that it has this beautiful warm midrange, so now you have a really complex sounding amplifier because of the British voice of the amp and the American voice of the speaker; it makes the whole thing just sound wider." Exactly! 2) Vox may be a company with a long and fabled history ... but they are also a company with a fantastic track record for not resting on past success and actually bringing very successful new products to the players. Their Valvestate line has been an enormous success, and the new VX line of modeling amps is the new standard for small, lightweight, and flat-out great sounding gigging amps. So it only makes sense that Vox would always be looking for ways to improve on the legendary AC15. 3) Okay, maybe this is just me, but I can't help but just bet when Vox saw an opportunity to have their amps carry speakers proudly made in the USA by the hands of a true speaker expert, they were totally overjoyed! You will never see a "Made in China" label on a WGS speaker! So there ya have it tone friends. A Flagship Amp manufacturer carrying a Flagship boutique loudspeaker. If you are a fan of both Vox amps and WGS speakers, the day has finally came when you will NOT need to rip out the stock speakers and replace them with American made WGS ... Vox has already done it for you. Oh happy day. I will end this blog with one STRONG suggestion: if you want one of the Limited Edition 2019 model AC15's with factory G12C's and the fancy cosmetics, do not delay! Word from the NAMM floor is that every single one of these models was gobbled up by a few select retailers within minutes, and they will all be sold nearly as fast, with most of them already spoken for in pre-order sales. Consider yourself warned!